The theory that our universe is contained inside a bubble, and that multiple alternative universes exist inside their own bubbles - making up the 'multiverse' - is, for the first time, being tested by physicists. Two research papers published in Physical Review Letters and Physical Review D are the first to detail how to search for signatures of other universes. Physicists are now searching for disk-like patterns in the cosmic microwave background (CMB) radiation - relic heat radiation left over from the Big Bang - which could provide tell-tale evidence of collisions between other universes and our own. Many modern theories of fundamental physics predict that our universe is contained inside a bubble. In addition to our bubble, this `multiverse' will contain others, each of which can be thought of as containing a universe. In the other 'pocket universes' the fundamental constants, and even the basic laws of nature, might be different. Until now, nobody had been able to find a way to efficiently search for signs of bubble universe collisions - and therefore proof of the multiverse - in the CMB radiation, as the disc-like patterns in the radiation could be located anywhere in the sky. Additionally, physicists needed to be able to test whether any patterns they detected were the result of collisions or just random patterns in the noisy data. A team of cosmologists based at University College London (UCL), Imperial College London and the Perimeter Institute for Theoretical Physics has now tackled this problem. "It's a very hard statistical and computational problem to search for all possible radii of the collision imprints at any possible place in the sky," says Dr Hiranya Peiris, co-author of the research from the UCL Department of Physics and Astronomy. "But that's what pricked my curiosity." The team ran simulations of what the sky would look like with and without cosmic collisions and developed a ground-breaking algorithm to determine which fit better with the wealth of CMB data from NASA's Wilkinson Microwave Anisotropy Probe (WMAP). 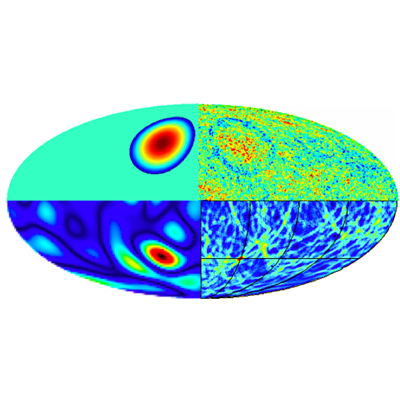 They put the first observational upper limit on how many bubble collision signatures there could be in the CMB sky. Stephen Feeney, a PhD student at UCL who created the powerful computer algorithm to search for the tell-tale signatures of collisions between "bubble universes", and co-author of the research papers, said: "The work represents an opportunity to test a theory that is truly mind-blowing: that we exist within a vast multiverse, where other universes are constantly popping into existence." One of many dilemmas facing physicists is that humans are very good at cherry-picking patterns in the data that may just be coincidence. However, the team's algorithm is much harder to fool, imposing very strict rules on whether the data fits a pattern or whether the pattern is down to chance. Dr Daniel Mortlock, a co-author from the Department of Physics at Imperial College London, said: "It's all too easy to over-interpret interesting patterns in random data (like the 'face on Mars' that, when viewed more closely, turned out to just a normal mountain), so we took great care to assess how likely it was that the possible bubble collision signatures we found could have arisen by chance." The authors stress that these first results are not conclusive enough either to rule out the multiverse or to definitively detect the imprint of a bubble collision. However, WMAP is not the last word: new data currently coming in from the European Space Agency's Planck satellite should help solve the puzzle. Image caption: The signatures of a bubble collision at various stages in the analysis pipeline. A collision (top left) induces a temperature modulation in the CMB temperature map (top right). The 'blob' associated with the collision is identified by a large needlet response (bottom left), and the presence of an edge is highlighted by a large response from the edge detection algorithm (bottom right). In parallel with the edge-detection step, we perform a Bayesian parameter estimation and model selection analysis.